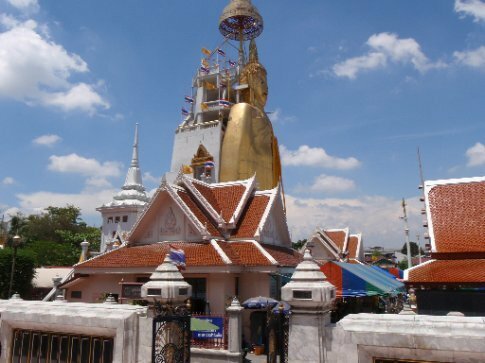 Bangkok is known as Krung Threp to the locals – the city of angels. Our arrival in the massive and massively modern Suvarnabhumi airport was straightforward after the three hour puddle jump to Sydney and a quick connection for the nine hour second leg with Qantas. SE Asia was where the plan ran out. Neither of us had spent any time here apart from my brief holiday in Malaysian Borneo a few years back so we were suitably looking forward to what David Scott, my old travel literature professor called “the other”. I had booked a place on Soi Rambuttri, near the infamous Khao San Road and asked the taxi driver to take us to the door. He found the street but not the guest house ... He shrugged his shoulders and asked for his 400 Baht fare. I was struggling too much with the double whammy of the unfamilar bank notes and the fact that a small elephant was outside the car, blocking my exit, to notice that my phone had fallen out of my pocket in the taxi. It was a complete sensory assault arriving well past midnight in Bangkok's traveller heart. The mahoot was looking for cash for elephant feed, the street bars selling vodka and red bull served in buckets I used to make sand castles with as a kid were looking for punters and all the while we were looking for our guest house. After a 20 minute wander, feeling conspicuous in our rucksacks we found it. At about 12 pounds a night for an air conditioned double we had landed back in the cheap developing world at last. The air con gasped into life and we struggled to find room for our bags around the bed. Good job it was only booked for 2 nights, enough to get our bearings. After a quick breakfast the following morning we went for a wander. The place was totally different by day – the street bars replaced by food stalls and vendors selling every type of tat you could imagine. Practically every person I made eye contact with and every tuk tuk and taxi driver came up and asked “where are you going now”, offering tours of the city for 10 Baht (about 20p) and generally perpetuating the cliché of taking advantage of the first day arrival. Only thing is it doesn't just last the first day! We strolled around the streets, trying and failing to make sense of it all. A random Thai woman said hello and started asking us the usual questions. She said there was a special government sponsored deal on today with the tuk tuk drivers that they would give a city tour for 20 baht. We had also heard that there was a big pro-Thaksin, anti-government rally on today aswell. She drew things on our map and then, unbidden went out to get a tuk tuk for us – she negotiated the 20 baht deal and we were off before we knew it. A surprisingly sudden and quite exhilarating MOT number 31. Still paranoid about being taken to dodgy gemstone shops (a common tuk tuk scam) we sought reassurance from the driver by pointing and gesture but he seemed genuine enough. Our first stop was the Wat Indraviharn, dominated by a 32m tall golden standing Buddha. It was a little strange to be on a tour to places we had never heard of and didn't know the significance of. Only later did we find out not only that it's the tallest Buddha in the world but that you can climb up him. Ah well. Need to read guidebook in advance in future. In a flash were off again and racing towards what we thought was the Tourist Information Bureau (of which there is only one in Bangkok). Actually it was a Tourist Agency (of which there are thousands in Bangkok, all trying to sell all manner of tours and trips). In retrospect I now think that that woman who sent us on this crazy trip was actually employed by this agency. We didn't buy anything and moved on, this time towards another Wat (temple) further North. The traffic was terrible and we didn't move for a long time near one of the filthy canals. Eventually we eaked forward enough to see the problem – a barricade of red shirted Thaksin supporters. We u-turned and headed up another way, but this time the traffic was worse, so much so that all the mopeds and motorbikes had reorted to driving on the path. The heat and fumes were starting to get really bad and the driver started looking stressed. Another 10 minutes and he said in broken English that he didn't know if it would take 1 hour or 4 hours to get to the wat or back to Banglamphu, where we had started off. We were better off walking back. To be fair he said we didn't have to pay as we hadn't done the tour yet, but I gave him the 20 baht anyway, thankful he hadn't tried to scam us. We walked back following the map, asking the police (mostly dressed in riot gear) for directions along the way, all the time dodging the bikers using the footpath. If we felt a bit bored in NZ we had now come to the cure!